This movie has it all – it’s scary, it’s violent, it has making out, alcohol abuse, illegitimate children, and weapons are drawn and used – repeatedly. And it’s a G movie! The first inkling of just what kind of movie it will be is during the first scene, when the star of the movie, Remy the Rat (voiced by Patton Oswalt) and his brother Emile (voiced by Peter Sohn) get caught in a farmhouse kitchen, and the previously sweet old lady who is always asleep in her armchair jumps into action and proceeds to unload dozens of rounds from a shotgun at the pair of rats – the shoot ’em up scene lasts a good solid 10 minutes, all told, and at several points it looks as if she has blasted the pair into little rat puffs (although in the end she hasn’t). All this leads to the entire rat colony having to move out of the farmhouse, and so the next scene is the rat evacuation through the famed sewers of Paris, during which Remy, afloat on a book, ends up going over a scary waterfall, and being tumbled about underwater. Once back on dry land, he scurries along the beams of several buildings – indoors so that we can see down into the various rooms – and passes by a couple who are arguing – the woman aims a pistol at the man, he jeers “Go ahead, you don’t have the guts”, we hear a gunshot, then we see them and it’s clear she missed, and they fall into each other’s arms and make up. 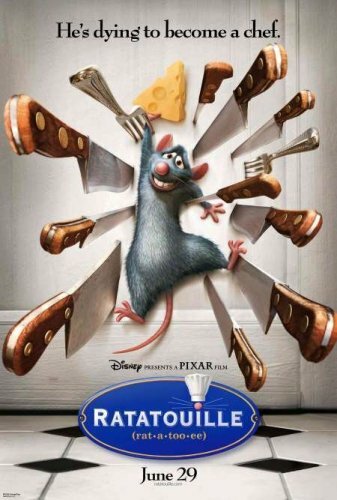 This is directed to the newest addition to the kitchen crew, Linguini (voiced by Lou Romano), who turns out to be the illegitimate son of the original owner of the restaurant – now deceased and appearing to Remy as a either a fantastic communication or a figment of Remy’s imagination – we’re never quite sure which. In order to find out his secret (and secure a hair sample for a DNA test), the head chef gets Linguini drunk, plying him with wine. A drunk Linguini wonders who would ever name a food dish “ratatouille”, because it sounds so much like “rat patooty”. Of course, Linguini and Colette have a romantic tension going, and there is some fairly in-your-face making out with closeups of kissing and, finally, Linguini pushing Colette up against the seat of her motor scooter, with him nearly laying on top of her. Yeah, it’s animated – but yeah, it’s pretty overt making out. Meanwhile, to convince Remy that humans are not to be trusted, Remy’s father takes Remy to a shop and shows him a window filled with dead rat carcasses hanging from what look like little meathooks. A pretty horrifying visual given that by this time, 3/4s of the way through the movie, all of the children in the audience have bonded with the adorable rats. Frankly, we were shocked that this movie was rated G.
Even the children we know who have seen this movie were surprised that it was not rated at least PG, if not PG-13. And that really tells you something. My sister took her three boys to see this movie and they liked it. I asked her if it seemed too violent and about the kissing part. She is a conservative christian and she thought it wasn’t that bad. I do have to add though that anytime there is an occasion to give one of my nephews a present she says what the want is “any weapon of mass distruction” !! I think little boys are used to and in to more violent things. Maybe this has jaded her,,or maybe everyone just has different opinions on what is too violent in cartoon movies. My nine year old daughter went with them to see it and her only comment was that it was wierd. I remember being horrified at the movie The Rescuers and various other Disney movies as a kid. I guess most parents should know what there kids can handle.